I came across this funny cruise ship story, written by a former crew member who seems to have plenty more stories where that one came from. "Any past/present crew member knows the all too often asked question - "Do the crew sleep onboard?" "Well, during my contract onboard the MS Statendam, a guest asked the question, and received the usual sarcastic reply. The following week, a memo was sent around the ship from the Hotel Director instructing all crew to refrain from being 'clever' like this in the future. 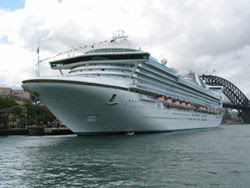 An elderly lady guest from the previous cruise had made a formal complaint to the cruise line on her arrival home that she hadn't got any sleep whilst on the ship because of all the noise from the helicopters flying the crew off the ship every night!"